This entry was posted on July 10, 2010 at 8:13 am and is filed under co-ordinates, Eileen Fisher, wardrobe planning. You can subscribe via RSS 2.0 feed to this post's comments. Both comments and pings are currently closed. I have linked to your site on my blog for a section I have started as discovering blogs, where I share with my readers, some of the useful blogs I come across. Your blog is such a knowledge haven for patterns. Thanks. Many thanks Lakshmi, I’m delighted to hear these posts are helpful for people who draft their own patterns. Nice post as usual Lisanne! There is a real dearth of nice knit jacket/cardigan patterns from the usual suspects. How about the bolero pattern from Vogue for the first cardigan? 8622. Has a kind of a similar feel, I think, and I’m pretty sure it would look nice in a drapey knit. I’m also loving the cropped 8522 jacket. Sigh. So many possibilities. Thanks for the interesting suggestions Elizabeth. I tried to pick patterns like the EF styles, which are light knits with fitted shoulders. I know you like cut-on sleeves, and they work well on your square shoulders. There’s a bolero in the new patterns issue, Vogue 8673, with fitted shoulders. That would be better for my sloping shoulders. Except boleros aren’t good on my short waist and high hips. Another way that our shapes are different ! 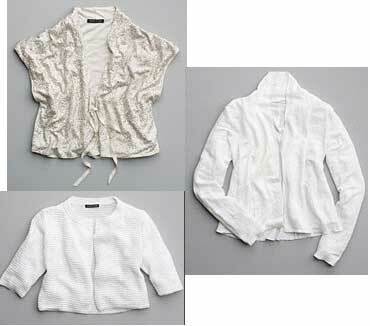 Most of the knit jackets these days have cascade fronts – do you like them ? Cascade fronts I am suspicious of, mainly because I think they will date very quickly and I’m a conservative dresser. I kind of like them on, actually. Ah well, I had my first, John Anthony Vogue 1387 pattern, in 1985. And I have a couple of Carol Horn Simplicity patterns from 1990. The noticeable difference is the old patterns have those huge shoulders, the collars are much the same as now. So I think of the cascade style as a ‘casual classic’ 😀 Though they don’t appear in any of the pattern making instruction books I’ve got, which are about the same age. Perhaps it’s because they suit my soft unstructured style so well that I’ve been noticing them more !